In-Page Analytics is a feature Google provides within its Google Analytics software. This allows you to view the action visitors take when on your website. 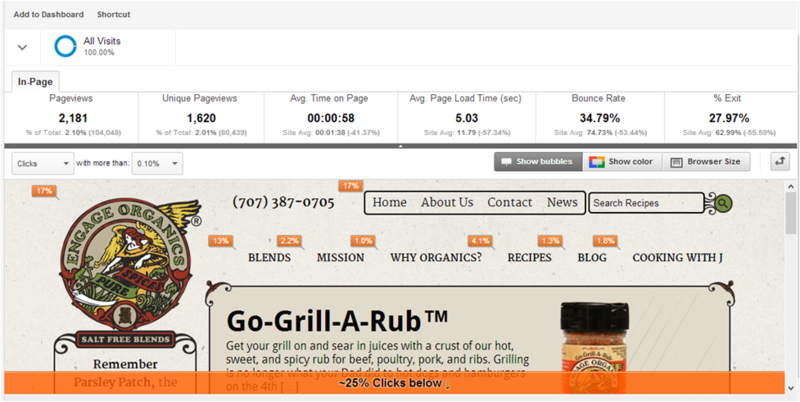 You will be able to see the percentage of clicks each link receives on a given page. This is valuable information as you will be able to view what links visitors are clicking on. With this information you can now see what information is most important to your visitors as well as identify any areas of your website need to be restructured for better site navigation. Nearly two years ago, Google announce Real Time Analytics. For those of you that use Google analytics, you may have noticed this but not paid much attention to this section within analytics in the past. Real Time Analytics is exactly what it sounds like, Google allows you to look at your site traffic in real time. While this may seem like a novelty and while most local businesses won’t use it often or at all, it can in fact be very useful for marketing departments. Where you will gain your greatest advantage with this tool is if you are running a targeted marketing campaign, you can change your approach based on the data provided. Real Time Analytics will give you data on current visitors, location of visitors, referral traffic. Whether you’re a one man shop or a large corporation, tracking your marketing is key; Google Analytics allows you to do this. You spend time, money and energy on marketing your business. Why wouldn’t you track the effectiveness? One of the best investments you’ll make is learning how to use analytics, you’ll save money on marketing in the future.